In this review you can find out all the information you need regarding 3M Cavilon Antifungal Cream 3390. This is an industrial anti-fungal product which has been released for consumer purchase in a limited capacity. 3M Cavilon Antifungal Cream 3390 eliminates the most common fungal infections such as candida albicans (yeast), tinea cruris (jock itch), tinea corporis (ringworm) and tinea pedis (athlete’s foot). It can also help with all the uncomfortable symptoms that these infections come with, such as burning, cracking and irritation. To learn more about the formula, pricing and guarantee of 3M Cavilon Antifungal Cream 3390, continue reading this review. Miconazole is the main active ingredient in 3M Cavilon Antifungal Cream 3390, and it is one of the most common and effective anti-fungal agents. It functions on the same basis as all other substances of this type. It basically prevents the spread of fungus and eventually eliminates it, by preventing the production of an enzyme which is essential for the creation of fungal cell membranes. As is the case with the active ingredient, the application of 3M Cavilon Antifungal Cream 3390 is identical to absolutely any other anti-fungal cream. Before you apply the cream to the infected skin, it must be washed and dried. Once this is done, apply a thin layer of 3M Cavilon Antifungal Cream 3390, and gently massage it into the skin to avoid stinging the sensitive flesh. The cream should be applied two times a day, and the treatment should last four weeks if you are using the cream to eliminate an infection. If the fungus is still around after the four weeks are over, you should go and talk to a doctor. The same is suggested in the case of irritation. Once again, the side effects will be similar to the other anti-fungal products you might have encountered during your research. Unfortunately for those among you who are allergic to some of the ingredients, you may suffer from side effects that are just like the symptoms you are trying to get rid of in the first place. These allergic reactions may include rashes, irritation, and burning. It is recommended to keep the substance away from your face and eyes, and children younger than 2 years old should not be treated with it. The product can be bought in packages of 12 units, each is a 5 ounce bottle. The whole pack costs $108.78, and shipping is free. Another purchasing option is to buy a single unit, which can be bought for $18.60. As this product has been removed from industrial circulation, and there is no guarantee policy in place for private customers. The lack of customer reviews is also troubling. 3M Cavilon Antifungal Cream 3390 is an effective product with a strong formula and a fair price. The lack of a guarantee and customer reviews, however, are a concern, and we urge customers to opt for a product with proven success. 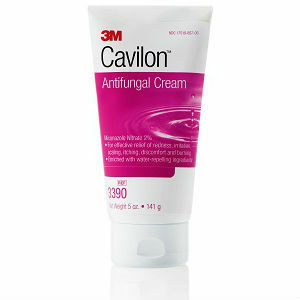 Jimmy Rodriguez	reviewed 3M Cavilon Antifungal Cream 3390 Review	on June 10th	 and gave it a rating of 2.5.